Four Girls and a Doctor: Mehta offers his recollections of the mostly unhappy love affairs that preoccupied his early years in New York, and of the psychoanalyst who helped him get over them. 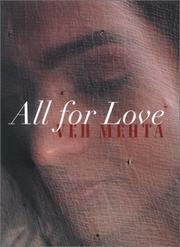 As a memoirist, Mehta (A Ved Mehta Reader, 1998, etc.) has made a career out of the rather extraordinary circumstances of his childhood and education. The son of a cultured and well-connected physician, Mehta grew up in India and nearly died of meningitis when he was four. Although he recovered, the raging fever brought on by the disease left him permanently blind. Since there were no schools for the blind in India at the time, Mehta was given an informal education at home by his father, and in 1949 (at 15), he traveled by himself to America and enrolled in a school for the blind in Little Rock, Arkansas. He later studied at Oxford and did graduate work at Harvard. This volume describes his early years in New York during the 1960s, when he was working as a staff writer at the New Yorker and beginning to establish his reputation as an essayist and journalist of renown. Most of the author’s recollections here, however, are of the various women he fell in love with during that time. Some of the affairs (with the dancer Gigi, for instance) were uncomplicated and relatively harmless, but others (such as his long romance with a poet and graduate student named Kilty, whom he nearly married) failed spectacularly and left the author in deep depressions that took years of therapy to undo. The last section of the account depicts Mehta’s dealing with one Dr. Bak, a Hungarian psychoanalyst who helped him sort out his feelings towards his lovers and himself. Moving and honest, if a trifle claustrophobic: Mehta’s scrupulous attention to detail makes his account astonishing vivid and real, although many of the particular details (e.g., the prostate treatments he underwent to overcome his supposed impotence) are a tad more informative than necessary.